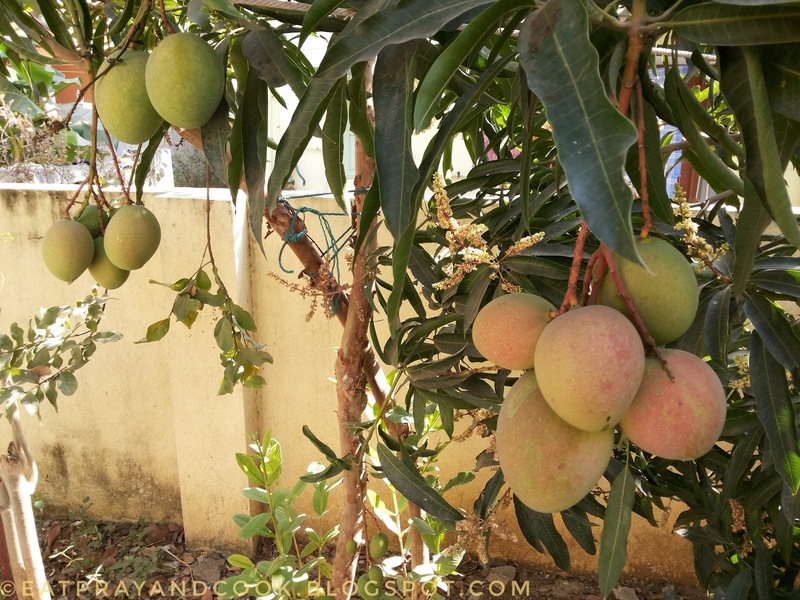 Eat Pray and Cook: Nature Watch - Mango Mania! It's end of May.. summer is in its peak. Nature never let us hate summer all together. It gave us mangoes and jack fruits to anticipate summer. Because of the heat, we really are waiting for the summer to go away as fast as possible. But that will take away mangoes too with it..!! And along with it goes jack fruit. This one and only mango tree in my mother's place is one of my best friend in that garden. Few years ago, it was a pretty young tree and we used to wait for the first blossom. One fine day in the month of January, I spotted a small inflorescence. It was such a surprise to see the blossom. That first year, there were limited flowers and fruits only. Then, second year there were lots of flowers and fruits. Overwhelmed with Mother Natures gift.. we shared those mangoes with all our friends and neighbours. The squirrels and ants and bugs too were very happy. We do not know the name of the variety of this mango as it did not resemble any of the commercial varieties of mango. These home grown mangoes never stop ripening even after kept in fridge. We have noticed that after 4 days in fridge, the fruits seem to have ripened more than how it was kept in fridge. The pictures above are those of the mango tree in my mother's house (last year). In the second picture you can see the beautiful mangoes and still many more happy inflorescence. 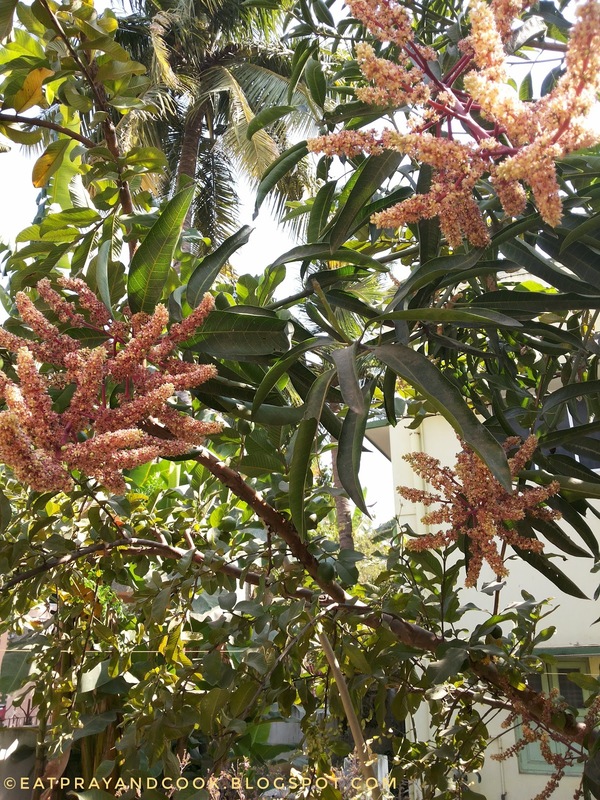 This year, I guess because of the cold winter which preceded, the mango tree bore very few blossoms only and hence fewer mangoes. Many of you might have seen a bigger or more prosperous mango tree. But for a person like me who loves trees and plants, but not had any chance of having a tree at home.. this is a blessing to be cherished. Read more in Nature Watch. Happy summer.. Happy mangoes.. and Happy Us !